It’s All About Setting Expectations! Our fundamental role as designers and project managers is to be effective translators. We need to recognize that our skills and specialties are alien to most of the people that we work with. Extra effort IS required to inform them about what we do, and how they fit into a good project process. I will be adamant about this. Almost ALL of the pain that you and your staff (and your consultants, and your prime, and your children, and your dog) feel is due to expectations not being managed effectively. I’m not blaming you… I’m blaming the typical process that we consultants seem to keep on using over and over. Namely… no process. This starts to get metaphysical, but probably the best discussion you could have with your client is establishing expectations for setting (and maintaining) expectations. Think about any friction that you have had in your life. I bet that most of them likely came down to (mis)communication, and probably could be described as being due to mismatched expectations. Mismatched expectations become conflict when we don’t have a process in place to deal with them. I think we do an okay job of numbers 1 & 2, but the rest have varying levels of success depending on our communication skills, and whether our client has someone with previous related experience or not. If you already ‘get’ where I’m going with this, check out some of my other blog posts now. If you’d like to hear more, read on. Our days are full of implicit contracts: I’ll pick up some milk. Sometimes they include explicit contracts like the Prime and Subconsultant Agreements I signed yesterday. We are very intentional when we are signing and dating a document, and less intentional with our implicit agreements. The latter has defined and legal ramifications if we don’t follow what we’ve agreed to do. The former doesn’t really have the same level of potential ramifications, except perhaps annoyance. If you forget the milk, then we don’t even get to the point of assessing whether the dessert is tasty. Your errand is confirmed. You have helped confirm a pathway to success. You could have simply not picked up the milk and gone home, and explained that they had no dairy. This would have illustrated that you missed the point of the whole exercise: a special dessert. Instead, you check in and develop mutual control over the situation. Not only did you check in to recontract, you also showed initiative in offering a potential solution to the situation. “Weird about the cows, but since you mention it, cake does sound pretty good.” You have a discussion and you revise your plans to accommodate the unknown. The pathway to success is significantly different, but you achieve the end goal of a tasty dessert. Let’s bring it back to consulting. Since quality is normally a final assessment, we can look at scope, schedule and budget as being the main factors to achieve desired quality. Risk and resources are important as modifiers to the ‘formula’ as they can add additional stability (like more skilled workers), or instability (eliminating schedule contingencies). The more pressure that is put on any or all of scope, schedule or budget… the more likely it is that things will deviate from expectations. As consultants, we have great systems for establishing scope and budget expectations. Where we (and our clients) get into trouble is with management of scope. I’d like to think that we’re too nice or too naive, but regardless… the fact is that we don’t set up realistic expectations that balance scope/schedule/budget, and we certainly don’t act in anyone’s best interests when we don’t tightly manage these. It’s really hard to say no to a client (until you have shared systems in place). That’s why pre-development delivers bloated space planning and project programming to schematic design. We waste so much time, effort and money because we don’t establish realistic expectations grounded in scope/schedule/budget. The ultimate blame for this lies with the prime consultant, but it also sits with the client. Well… us subconsultants are also guilty when we don’t speak up, but we often aren’t invited into the big picture. Most of the time the problem lies in the fact that the client doesn’t have the money for the project they WANT… and we certainly wish that we could always give people what they want! 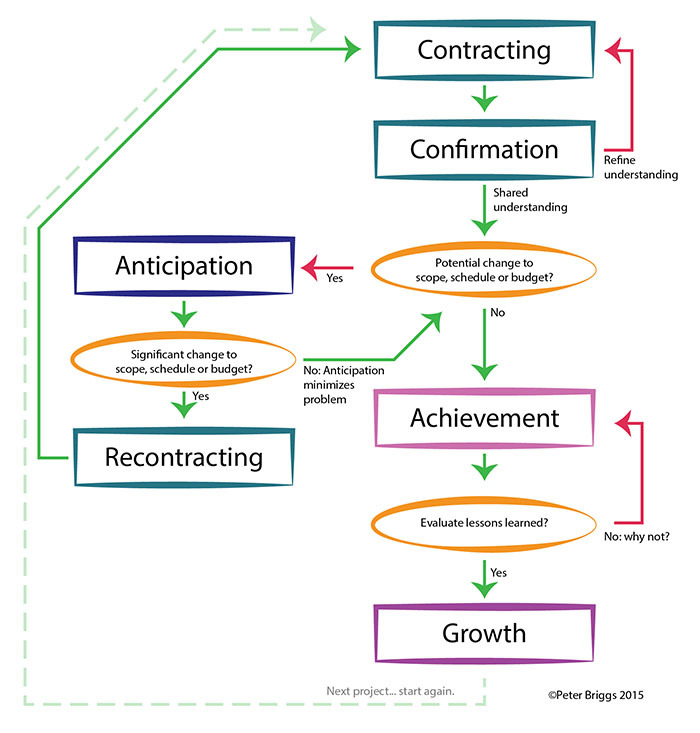 Finding the project they NEED is essential before project expectations are set. See Trying to Avoid Work to Benefit our Clients. We will have some tough conversations. We’ll have a process in place for these conversation, and we’ll try to anticipate them to the best of our abilities. We need to both have a shared understanding of what ‘perfect’ means for this project. Let’s try to visualize what success means. What are the ten things that you need to see when you are looking around at the ribbon-cutting? We’re going to work hard with you to make sure this project is right-sized for you. You save a tonne of money when you don’t build things! Let’s have a discussion about how you will learn to use your new building/landscape… and that there will be challenges. Imagine reorganizing your kitchen for efficiency. You know you’ll spend a month or two trying to remember where something is, but in the long term it will be better for you. New buildings and sites are the same, and come with frustrations until you’ve learned them. What other painful conversations did you have during a project which you could have had at the beginning? There’s nothing wrong with discussing previous challenges with your clients in order to show them that you learn, and you don’t want to revisit them again. It’s impossible to write one blog post to cover setting and managing expectations. Remember that the take home message is not just set expectations. You also need to recognize that they will need to change, and that a process for expectation management is critical.. Questions serve many purposes, but for the sake of this post I focus on asking questions with the goal of understanding a situation and the needs and wants of the people within it. So… let’s start with the fact that an answer is only as good as the question that inspired it. If as designers we are to be good listeners, we need to understand how to ask the right questions. Remember that your goal is to try to understand everyone around you, and that you are irrelevant except as a facilitator. A friend once told me that when she is running a public meeting, her goal is to leave that meeting knowing as much as possible about the attendees… but having attendees know as little as possible about her. The meeting has absolutely nothing to do with her, so her opinions, ideas and frames of reference shouldn’t taint the process. We speak only to ask questions ad seek clarification. Why do we want to ask questions? Understanding the situation: The most common reason to reach out to people is to understand a project’s fundamentals. What are the opportunities and constraints? What are the strengths and weaknesses? Problems to be solved? Let’s open it up to understand the situation. Gain Support: When you engage with people, they will hopefully gain some ownership over the process. This can be used for the powers of good, the powers of evil or somewhere in-between. Within the context of wanting to genuinely consult people, we’ll discount autocratic, ritual or placatory reasons for a planning process (Boothroyd, 1986). For our purposes, gaining support is an outgrowth of a good planning process. The Task at Hand: You will need to know enough about what you are doing in order to develop your questions. You will likely learn and refine your questions by interacting with your client or stakeholders. I find that questions change after you ask them a few times. They refine themselves as you discover the unintentional consequences of their wording. Who will we be questioning? Know your target audience. You may just be asking your clients questions. You might be consulting a whole community. Their level of knowledge: Be careful about the shortcuts that you might take. Your client might be the only person that you question, and might have worked with you before, but don’t assume that your “shared language” is in the best interest of getting good answers. Don’t skip levels within a process if you can avoid it. When you do a full process, you might find that you’re asking the right questions on the wrong project (see Trying to Avoid Work). The ideal project starts with no assumptions. Their level of communication: Cultures have communication shortcuts. We need to be very careful about these, as they are assumptions (see bullet above). Working in a cross-cultural context is an ideal way to understand the fundamentals of communication. Shortcuts are not necessary, and they are sometimes not fair. If we approached all processes with the tools developed for the challenges of cross-cultural communication, I believe that it would clarify communication. A little extra time in the beginning usually saves more time later. There are good resources on line for more specifics or guidance than I give below. Search for “asking a good question”. Context: Provide information and context to allow people to develop answers, but avoid anything that would seek to shape their answer (intentionally or unintentionally). This can be SUPER hard for us designers where we are taught to try to convince people that our ideas are the right ones for them. One Question at a time: Ask one question at a time, and make sure it is simple and clear. Don’t Influence! Don’t influence people’s answers by the context that you provide, or the questions that you ask. Neutral Wording & Avoiding Leading Questions: Simplify your question as much as possible. No adjectives or adverbs. Use words like ‘describe’. Don’t influence the outcome. Open ended questions allow for brainstorming. This is needed to allow freedom of thought and to find the unexpected. Specific questions allow clarification and refinement. This is needed when narrowing down ideas or prioritizing. Either/Or: There will be times where one option or another is a good question, but remember that asking a question this way limits the options to those you are listing. The power of why. The first question will likely not get to any root cause. When you have an important question developed, a good exercise is to ask why five times and encourage people to drill down to truly understand something. Intentionally asking (and answering) “why?” encourages people to stop and think (and perhaps discuss) what is behind their answers. Plan it from start to finish: You will use different questions and different tools as your group gathers, distills and synthesizes information. You should have this whole process planned out and optimized. Then, you also need to be prepared with a Plan B and Plan C… and be able to adapt and clarify. You Can’t Give Up: No matter how strange someone is, they will likely have something valuable to provide to your process. It is YOUR role to help them. Facilitation as a Martial Art: Jujitsu involves receiving energy and redirecting it. Your role is to redirect whatever energy is aimed at you to find the place not only where it belongs, and where it ideally benefits the process. If this energy involves anger/frustration/confusion, it is likely that at their root there might be a useful piece of information. When you discover it, you might be able to re-purpose it for the betterment of your project… and result in someone that feels like they have been heard. Listen! Listening is hard until you practice it. We want so hard to contribute and identify with people, but when we do so we wind up risking changing results. Be a good interviewer. This is hard! Your goal is to allow someone to be themselves, and to find the right way to speak and be heard. A good interviewer moves beyond the surface and teases out real information. We Just Want to Be Heard! Whether recently, or since the dawn of time… humans just aren’t good at listening to one another. This means that we often don’t feel like we’ve actually been heard. You have the power to listen to people, and actually hear them. Not only hear them, but shown them that they have been heard. Do not underestimate the power of being heard. The contents of this blog arise from the ‘conversations’ I’ve had with people; whether in person or through various digital interactions. My goal within this is: I’d like to support someone in solving what’s important to them… with a conversation. Share knowledge, experience, stories and crazy ideas. Contribute to the building of professional networks. Expose ourselves to different ways of looking at things. Brainstorm, reinforce and develop ideas. I want to offer each person an interested listener, who is focused on them… and who just might help them find something useful in chasing their goals? Arrange to meet with someone for about an hour. Perhaps longer if the provided therapy/learning is mutually beneficial. Who Will I Meet Up With? Part One: The First Twenty! The first twenty conversations would be with friends and associates, with a cross-section of careers, seniorities and people. Part Two: The Second Forty! I think there’s value in not just speaking with those I know, but also meeting new people and hearing from them. During the first twenty interactions, I’d ask each person to recommend two people that they feel would find value in this kind of interaction. This would introduce one degree of separation. Part Three: The Third Forty! Similar to my last selection of forty, this one would be based on asking each person of the 40 to recommend one person. This would introduce two degrees of separation. I think that each conversation will likely lead to a related blog post. Perhaps it leads to a guest blog post by the person I meet with? I’m not certain about the above, so I’ll leave it flexible. An NFB animated favourite – What on Earth! To distill what I like about the website is that it’s grounded in clear goals, clear criteria for success, and generally quantifiable approaches to assessing what will (or will not) lead to those goals. To some extent or another, most of us (unintentionally) subscribe to some external motivator(s) that move us in ways that we might not otherwise choose. This will be your farm someday, son. I’m proud of you being a lawyer like your dad. I need the health insurance and pension!!! I think this is why most people have some kind of mid-life crisis of one flavour or another. It’s only natural to get to a point and look back and wonder, “How exactly did I get here?” followed shortly by, “Do I want to be here?” It’s a reaction to realizing that we’re not as intentional as we might like to be. The discussion about being intentional in our own pathways is likely a general theme of this blog. The intent of this post is to directly tie the concepts of frugality to planning and design, and to how we approach our work. I sometimes feel like my goal with any client is to figure out whether I can talk them out of my services. It’s not some strange desire to inflict harm to my business. It’s a realization that clients sometimes don’t exactly know what they actually need (see: Trying to Avoid Work To Benefit Our Clients)… and that I can build value in my client if I can match them with the consultant that they REALLY need. At this point in my career, I want to build value in my network and build value in others. I know they will do the same in me. Then we get to focus on our skills and how we deliver highest value to our community. I also feel that my goal with a client is to figure out what I can talk them out of constructing. That’s where this blog originates with Mr. Money Mustache. Take a second and read his post Understand the Drive-Through and We Can Understand All Problems. He’s not a landscape architect, or a planner (but has experience in building and construction). He has developed a lens of frugality through which he views the world. In case you didn’t go to his post, I’ll just quickly summarize that he looked at a bank’s drive-through system and saw the lost value in potential urban density. Value lost to allow us to stay in our vehicles with the engines idling. What I would see as poor planning and design, he saw as waste. (As an aside… why is it that we treat cars as the dominant life form on Earth rather than people?? I LOVE this 1969 Canadian Film Board animated short What on Earth!). 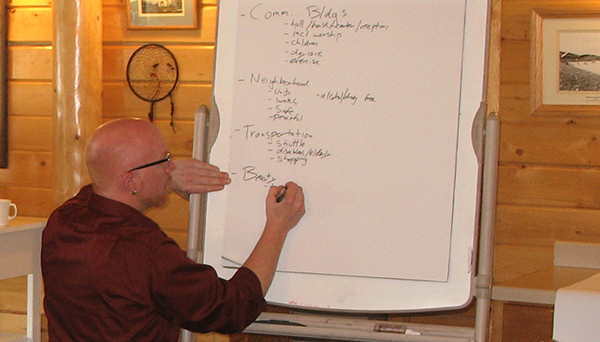 Planning is way more complex than a typical person would realize or expect. I fully understand HOW our cities develop (grounded in my mild cynicism), but the WHY is truly founded within strange code and ingrained ways of doing things. Sadly, working against (and even with) the system can be a long and hard road. Our systems have achieved lives of their own, just like the ‘lives’ of the cars in What on Earth! I grew up with a fairly frugal outlook on life. But, as always, have only recently appreciated how that outlook applies to what I do as a career. I find it easy to try to match the correct level of our services to our clients. It’s much more difficult to match the correct design to the correct client to the correct site to the correct problems etc… There are so many variables and factors, that we get lost within them all. We sometimes turn around and see we’ve put in a banking drive-in on a piece of land that should have had a higher use. We have no good excuses other than we didn’t have the time, or the support, or the societal awareness, or whatever, to stop for a second and think about different outcomes. Let alone convince the other decision makers. For those of you with means. For the thoughtful developers. For the city staff who use the system for change. For those of you committed to the long fight. I applaud you when you take a longer view and put your money and effort where your community is. Paradigms are finicky. Sometimes it’s just a matter of finding the right words to get people to say, “Oh. I get it now.” I’m not sure if frugality and its criteria will achieve this paradigm shift, but for me it makes sense today and adds some light for me. Problem: Our ideas aren’t in space yet. Solution! 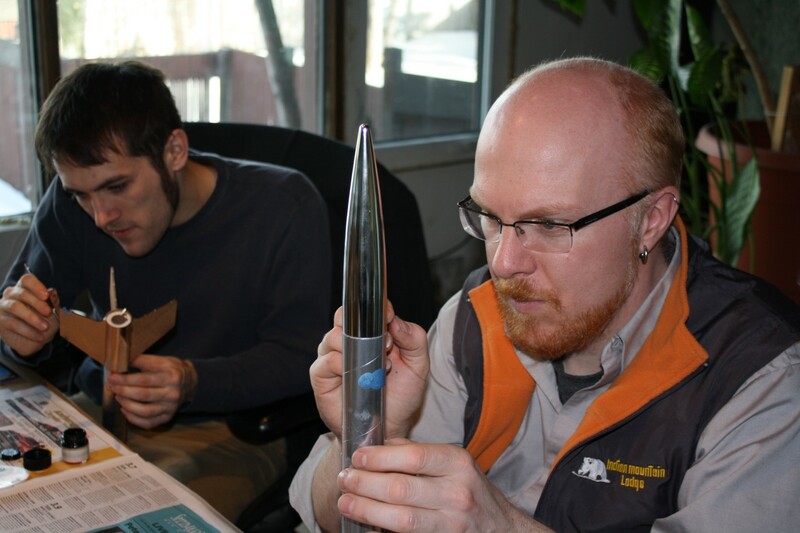 Make model rockets. I just saw a simple but fantastic post on someone’s facebook feed: Don’t ask a student what they want to be when they grow up. Ask them what problem they want to solve. What I like about this is that it illustrates the importance of asking the right questions. We cheat when we interact with each other. We ask simplified questions, without stopping to wonder what we are REALLY hoping to hear. When it comes to kids, we just want to be entertained when they tell us they want to be a fireman. It’s something we can reminisce about when they’re an adult. (My answer when I lived in the middle of the prairies as a kid, was marine biologist. I probably hadn’t properly considered the whole thing. But it sounded cool). If we actually wanted to understand WHY we got the response, we could have started off with a more challenging question. We need to ask questions of each other to try to get to the root. Then we can start to apply solutions to it. So, instead let’s ask, “What problem would you like to solve?” Fires. Cats stuck in trees. People who are injured. Retiring with a pension. With those answers, we’d all see “fireman” without just leaping to that point… and we’d get insight into the kid’s mind. What relevance does this have to the business of design? So… how about we start the discussion with: What problems would you like to solve? Our CAD library is disorganized. I’m concerned with the homeless problem. Our city isn’t implementing Complete Streets very well. My knowledge of permaculture is lacking. These shake up the conversation, and give us the chance to really empower our staff within areas where they have passion. That’s our goal right? But have you tried asking people what their passion is? It seriously doesn’t work very well. Passion! is so loaded and huge that it almost feels egotistical to answer. BUT… ask them what they’d like to solve? It makes it easier and actually points to where their interests lie. This is a new brilliant flash of the obvious for me. Such an amazing change to the way we get information from our staff, our students and the public in general. What problems would YOU like to solve? Then we have a great discussion. I love the term “brilliant flash of the obvious”. For me, it’s usually the product of long analysis, interesting conversations and deliberation. We get to the point where we’ve overthought something, and realize… the answer is simple and was just waiting for us to get to it! But, the fact is that we had to go through the process. When a thesis advisor of mine (Larry Harder) told me about the phrase, I believe he credited a Canadian landscape architect named Michael Hough. I’ve had this phrase/concept long enough that it’s a goal for me to find this elusive “brilliant flash of the obvious”. Another thesis advisor (Dr. Robert Brown), left me with one of my most important “flashes of the obvious”. From his research methods course, I realized that if you outline your criteria for success prior to beginning your work, you have the power to define what success is. The power of this is that it encourages strategic thinking, the development of a concrete process to follow, and provides you with rigor that can be applied to the assessment of your final product. The easiest example is a playful one where you intentionally set the bar low for success. For example, if you state that your goal for a park design is to have it be an open space with seating… then success could be a parking lot with a bucket to sit on. Success!!! The point of this blog post is to emphasize the value of entering into tasks with a goal (or goals), and understanding how these goals will be met successfully. As a landscape architect, the most obvious application of this is the development of an agreed upon scope with your client. You need to establish not only what they want, but what they actually need. They often don’t know the ‘need’ part… and that is exactly why they have hired you with your expertise. Our success in this effort is directly proportional to our experience (knowing what to ask) and our communication skills. Good habits are often reinforced by avoiding bad outcomes. Losing money sticks in our minds. The “brilliant flash of the obvious” part of this relates to the fact that we apply special tools and techniques with our clients in order to achieve solid communication (to avoid losing money)… and then we turn around and wonder why our staff do strange things? Why they didn’t approach a task the way we’d want them to approach it? Have we stopped to see if we’ve invested the time and effort into this the same way we do for things like losing money? When we do think about it, I think the answer is that we didn’t establish an appropriate scope with staff… and perhaps more importantly, we didn’t establish how they would be accountable for their work. Our coping/communication skills are dependent upon the level of familiarity within our relationships. I can remain perfectly calm with a grumpy client. When I’m at home, an empty toilet paper tube in the bathroom can trigger an evening of passive aggression. We spend most of our waking hours with our staff. This creates complacency with our relationship, and complacency leads to losing sight of the importance of good communication skills. We spend so much effort with effective client communication, but we just can’t seem to ‘find the time’ for staff. It’s not to say that things are dysfunctional, but there are certainly some things that we should be doing to set us all up for success. We can do better! So… back to criteria for success. If I’m working on a project on my own, I already have my own ingrained criteria for success. It’s easy to agree with myself and have a joint vision of where I need to go. In this case, there is an I in my Team. My Team is I. Add another person to the mix (or more), and the need for a common vision and criteria for success becomes obvious! Right? Well… think about your project initiation process and see how it actively engages your team into shared accountability. If you DO have processes in place for this that you are successful… please share a comment on this post. Regardless… please read on. We’re adults. We do our job. We can support those around us when they ask us to help out. BUT… until they bring us into a shared vision that we understand, we won’t be operating at our highest expertise. AND… we won’t be operating with initiative and passion until they craft a vision that somehow includes us. It’s human nature… we’re most involved when our tasks reflect us. So… I’ll go back to the importance of establishing criteria for success. Below is a quick example of how this could happen. It relates to the importance of having a shared company vision that relates to all of your projects, and then project-specific vision. Task 1: How Do We Measure Success? A good way to do the above is to give employees post-it notes and ask them to write one answer to the question “how do we measure success”, one per note. Use markers to make them bold and easy to read. 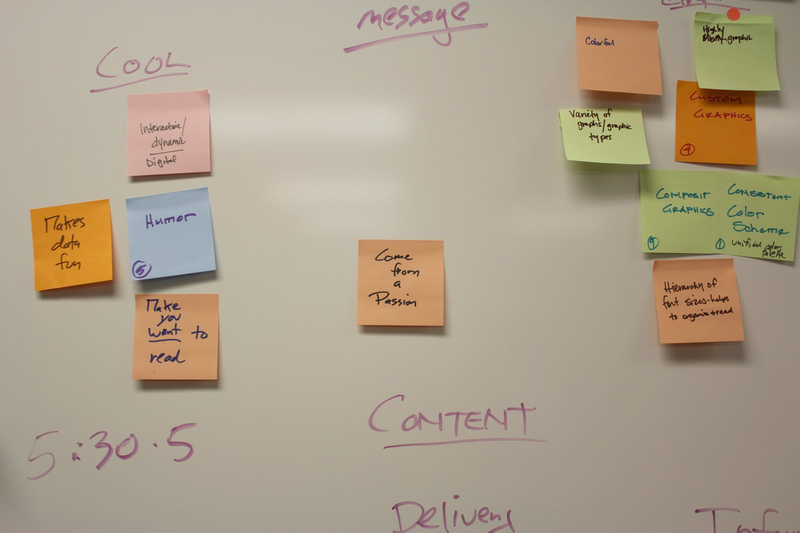 Use different colors of post-its and markers to make it distinct and cool. Do not underestimate that the process itself it super important, and that includes how it looks and communicates. Have each employee read their note, and put it up on a wall (whiteboard is great). As people add them, they should star to group them into similar groupings. As more are added, these groupings may also be divided into sub-groups. An important part of this is to discuss and examine hierarchies. Some of them might start to be specific, and they will lead into well the next phase of this process. Use this as an opportunity to stop and have those amazing “business of design” discussions that could result from this. You will likely find the perfect place to discuss your company’s mission and vision… if not even realizing that they can be improved to better reflect your company, staff and all. I’m assuming you have a business plan or similar that outlines your mission and vision. You do have that, right? Task 2: How Do We Measure Task Success? This discussion is specific to a particular project your office may be doing. It will expand upon and add specificity to items in Task 1. With this exercise, we’re walking a line between an internal agreement on what your firm is expecting of itself and its staff, and the development of project programming. That’s okay… final programming will lie with a client on any project, but your brainstorming may help you identify the questions you should be asking your client. The conversation that spurred my thoughts on this blog post relate to a shared discussion of quality in my office. Our goal is to have our staff state what they feel represents the level of quality that we wish to achieve. We’ve been talking about infographics in our office. We want to use the development of infographics to investigate our passions, refine our graphic design skills, and develop our approach to simplifying the presentation of potentially complex information. I could have issued this task by stating my top ten criteria for a successful infographic… but… that’s really kind of useless. Seriously. We’re designers, and as soon as I do that… I WILL limit what comes out of others. It might look like the easy way, but it does no one any good. What are the elements of a high quality infographic? 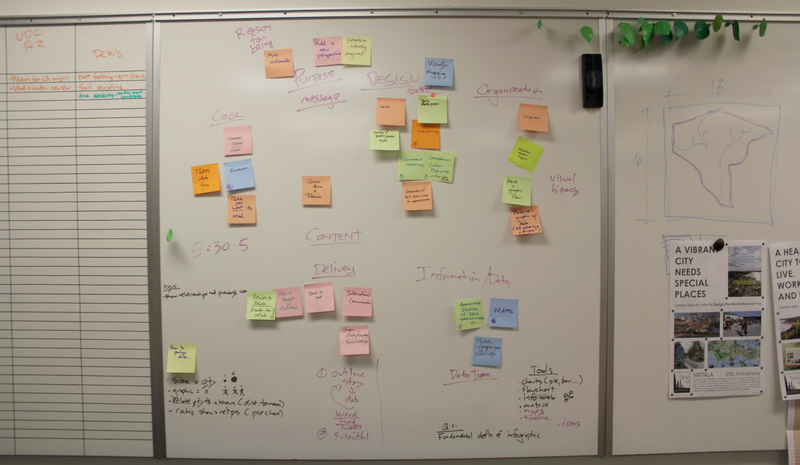 So now we have more details as to what we as a group consider to be the qualities of a successful product. Task 3: How Do We Quantify Success? This task gets down to the point of this entire blog post. We’re tying to remove opinion from assessment in order to increase the potential not only for success… but awesome success. If I were to have asked for a “great infographic” without any other information, I run the risk of setting my staff up for failure. Odds are that we would NOT have a shared vision of success. So… down to the details. The discussion went into what exactly does something need to have to achieve it’s goals? The best part about this discussion is that we are working on a shared dialogue within the office that will benefit every project. When we understand what we mean by quality, by going through a specific case study, then we will start to open ourselves to small and large “brilliant flashes of the obvious”. OHHH!!! Peter has no idea what an infographic is!? He just wanted a bar chart??! Now we can open his eyes to how an infographic is soooo much better. Has a start, middle and end… and hopefully tension, conflict and the other things a good story has. Where all of the above leads is that you have achieved a shared group vision. As a supervisor, you now have specific components to measure product success. As a peer working on the project, you have the tools to push each other when you say, “Is our story strong enough?”. Without this shared language, pushing another person can lead to conflict. With it, we can guide the conversation to how we get to our agreed upon goal. Since we have agreed on what quality means, then we can review the product and congratulate the team on achieving success. If the product falls short, we can speak to what might be lacking and measure it against our group benchmark. I bet that most of the time people respect this accountability tool. BUT… recognize that communication is elusive. There might be the chance that what is lacking was not fully understood. Use it as an opportunity to continue the discussion. It’s about finding a shared understanding, and embracing the growth that will be a by-product of the right approach. This shared vision is incremental, and experience dependent. You will hopefully have a common shared language with a person you have worked with for ten years. Don’t get complacent. These approaches have value, and allow evolution with each repetition. Also… they are critical to bringing new staff into the vision… AND… allowing the vision to shift with the good change that they bring. Thanks for reading all of the way. The summary of this is that we spend our lives facilitating our clients and stakeholders, but we don’t seem to use those same tools to benefit ourselves and our staff. When we stop to do that, we reap many benefits… with the most important being strengthening shared communication and establishing accountability. The only real accountability is that which we enforce on ourselves. In order to internalize accountability, we have to be a meaningful part of the process. When we are subconsultants, we are aware of our place within the world. Site design and landscape often aren’t the highest focus of attention within a project. We’ve developed approaches and skills where we try our best to deliver high value, even in the face of a lack of engagement or sub-optimal processes. We operate at our best when our teams recognize our role no matter how small, and provide us with what we need. Sometimes we just need some sympathy, but more importantly… it comes down to understanding what we do and supporting our role. Landscape architecture is a profession for a reason. We bring a high level of value for understanding and acting on how people use and enjoy their lives outside of buildings. This certainly relates to health, safety and welfare. This might be off the radar for some clients, but there are many small decisions on a site that could bring immense value. Without anyone ever knowing. I think that we gain some pleasure realizing that much of what we do will never be actively recognized. We realize that what we do actively and positively shapes people’s experiences and quality of life. Conversely, I think we also gain guilty pleasure when our advice wasn’t heeded, and you hear grumbling about how a site design doesn’t function so well. We’d love to say, “We told you so!”… but we don’t. One of the best descriptions of landscape architects is that “we are a shade loving species.” There’s more in that for another post at some time. When we work with architects and engineers who have realized our secret value, they see it as something that they want to harness in order to deliver value to our client. They have developed teams where no matter how small, they work with the people that they value. It’s human nature that we all work at our best when we are valued. If you are a client, architect, engineer or another person who might work with us… if you don’t fully understand what we bring to your project, please ask us. Our goal is to create a site and atmosphere that benefits your business or mission! We will only be successful when our clients are successful. This applies to everyone. When you seek to understand the value that someone brings to you, you will create value that wasn’t there before. By you reading this, I’ve successfully lured you into being benevolently manipulated! But, don’t stop reading… it’s a good thing. Should you and I interact, my goal is to do as much as I can to ensure that our interactions contribute to you being highly functional… and in turn, guide you to doing the same for me. [muh-nip-yuh–ley-shuh n] – skillful or artful management. Combined definition: To artfully manage others to assist them in reaching their potential, recognizing that this will in turn benefit us. This will be a short post. It’s really about an intent to understand the person you are communicating with. The idea is that whenever you encounter resistance or an issue (these are the easiest indicators), you stop for a second and think about how you can control the situation and work toward a “win-win” resolution. This is especially useful with people you will continue to interact with, as you will slowly find what works. Humans and trial-and-error go hand in hand. Scenario: You came to me with a set of drawings for me to review. I take them from you and begin to look at them. Your intent was that I review a few specific details, but you may not have communicated that effectively (or I didn’t listen). Your Reactions: You’re not happy, because you had only needed a specific range of input from me… and now you’re hearing about the things you already knew weren’t done. Depending on how well I deal with things, perhaps you’re also worried that I seem grumpy. It’s a cascading list of potential sub-optimal outcomes. Alternate Universe: You realize that communication is best when it is specific, and focused on the end product that you need. You also know that Peter’s eyes wander and he looks at other things. You print out ONLY the thing you want reviewed, or you circle it and write “look only at this”, or you have notes in the set that relate to incomplete redlines… so that when I reference other drawings, I see that it’s ongoing and you have noted my previous concerns. Result: You have managed me to respond appropriately to what you want/need. You allow me to operate at my highest level for allowing you to be at your highest level. We all want to operate at our best. We are weak and we are prone to our own shortfalls. When we are at our best, we try to overcome these… but when we are tired/grumpy/hangry/etc… we may not be the people we want to be. If people approach us with an optimized “Peter-centric” approach, then we’re starting off on the right foot and we can control the unintended consequences. Perhaps permitting is getting you down? Permitting is staffed by people. Make it as easy as possible for them to do their job. This is just life: CLARITY in what you give them. Clear documents that consolidate the things they’re looking for. Think about what they are concerned about, and try to correct it in advance. This is just life: AVOID doing the things that you know annoy people! Include things in the project that appeal to their approach to their job. This is just life: GIVE them something that they can recognize as theirs and find a sense of ownership. Realize that their job isn’t to make your life miserable. It’s to do their job. This is just life: UNDERSTAND their job and how you can assist them in doing it better. It’s 2015. Play is for All. In Anchorage, there’s a roller rink that recently forbade a child with a disability from being out on the rink. I don’t have children. I don’t have a disability. My family doesn’t have anyone with a disability. For some reason or another I passionately believe that it is a human right for children to have access to play. More importantly, that children have access to being with their friends. Even more importantly perhaps, that children have a right to the opportunities to make new friends. When I was a kid, I moved at the age of 9 and 12. In retrospect, I feel that those two times were perhaps poor times to move, because you land in a place where the other kids already had their groups of friends. Whether for my own sensitivity or not, I felt a bit out of place and like I was always missing out on what the others were doing. The reality is likely that everyone felt the same, but it’s left me with a desire to ensure that kids always have a place and that they have the support to fit in. So, I believe that kids have a human right to be able to make friends. As children, we make countless relationships (long and short) on the playground. Play is natural to children, and until we learn otherwise, play is open to others to join in (and to invite us in). Discrimination or the concept of “not like me” is a learned trait. As a play designer, I subscribe to the “smorgasbord approach” to designing play environments. Every child learns differently and has different things they’d like to experience in a playground. This changes as they get older and move through their phases of development. Playground design should start with trying to accommodate a variety of play needs and desires. The average person likely doesn’t know the full extent of disabilities that might influence a child’s ability to engage with play. Physical disabilities are the obvious ones, but account for only around 1% of disabilities. Good play design takes this “smorgasbord” of features and assembles them in a way that they begin to have order and cohesiveness. Order is an important way to begin to design for disabilities like autism spectrum disorders. The point of this? Play design seeks to remove the barriers that might get in the way of a child experiencing play on their terms. Taking this “smorgasbord” and assembling it to accommodate a wide variety of children may require some minimal extra cost, intellectual consultation or perhaps adding a few play elements to maximize impact… but the results provide a high return on investment. So… a roller rink forbade a child with a disability from being out on the rink. Designing for physical disabilities can certainly result in extra costs, but I quote Justin Trudeau … it’s 2015! But, for the roller rink… actual access is not the issue. Their concern is liability and potential danger to other skaters. I’m not writing this to discuss the specifics of this incident; it has been very well covered by others who are closer to it directly or from similar experiences. The world is not an accessible place. It’s not naturally flat, and surfaces are not naturally hard. Access advocates are clever people, and they realize this. They know that there will be challenges, and some of them will be true obstacles. But, their request is that we let people choose what their obstacles will be. They are 1000% correct that sometimes we will be amazed with the ingenuity and initiative that drive the amazing. If we just say no, then we close the door to that opportunity. Our built environment will have many places that are not easily accessible. Advocates are not asking that all places be made accessible. They just request that they be given the chance on their own volition to do things if they can achieve them similarly to others, without danger to others, and without danger to themselves that would create liability for others. It’s a fact that every person who is “able” is free to endanger everyone around them (and they frequently do). But, I won’t go into our freedom to do dumb things… although I’m finding it ironic that we limit people with disabilities when the abled are more often those who inflict true costs on our culture. It’s so easy to retreat back to a place of liability. The United States certainly suffers from a very high level of fear of litigation. There is reality to this, but there is a cultural fear of the possibility that one might be sued. This means that society has trained itself to start from a place of “no”, and then slowly (if ever) move toward yes in an extremely ‘safe’ fashion. This is significantly different than beginning with the possible and crafting it in a careful and justified way. I’ll go back to playground design. We have a responsibility to allow someone with a physical disability to get to the playground. Whether on a bus, or through an accessible parking space… they deserve to get to the same place as everyone else. That’s a legal fact of our society. We don’t necessarily make it as easy as it should be… but this is where we are. In 2015 everyone should be able to get to a parking lot or sidewalk that is reasonably close to a playground. We also have a responsibility that there is a reasonably direct way to get to the playground itself. This is where things start to get amorphous. There are requirements for playgrounds to have a certain proportion of equipment that is accessible. (This accessible equipment could consist of the most boring pieces. Good play design isn’t a part of it.) So, your child should be able to get to the equipment to play with at least some of it, and interact with other children. But, they will likely get to a point where their friends move into a play experience that is not accessible. They are now disassociated from their friends. Now… also realize this applies to parents. There will be parts of our playgrounds that might not allow you to interact with your children if you have a physical impairment. Just imagine that your child gets hurt (perhaps badly) and that you can’t get to them. Even though I don’t have children, I certainly empathize that this level of powerlessness could be devastating. While it would be difficult to design all playgrounds to be fully accessible, we can make decisions that maximize the potential for interaction. There’s a reality that children love slides and climbing up high. Ramps can be provided, but they can be cost prohibitive. If you exclude those two playground needs, building a very highly inclusive playground based on ground level play elements is feasible for every community. Play needs to be a community-level discussion. Every playground does not need to do all things for every child. For the same of this discussion, every child should have access to the play that they want/need within a reasonable distance of their house. This doesn’t mean that all playgrounds need to be fully inclusive, but it needs to mean that all playgrounds are designed intentionally to maximize their impact. Sometimes decisions will be made to provide that tall slide that provides children with an amazing sense of accomplishment for conquering their nervousness. When you provide that slide, you also need to ask yourself… how do we provide that same feeling for the kid that might never climb up there? Inclusivity isn’t about providing access to every piece of play equipment, it’s about trying to provide different opportunities to experience the same benefit… and trying to maximize the opportunities for interaction. Can’t get to the top of the slide? Well, let me be waiting at the bottom to see my friend come down. One of the best things for inclusivity on a playground is accessible play surfacing. But wow! It’s expensive and its cost could certainly be put into more play activities. But when properly done, it becomes a play activity in itself and these costs can be balanced. Play surfacing is a huge discussion of its own (that I’m always happy to have), but for the sake of this note… realize that it truly begins to eliminate obstacles for interaction. Let’s get back to the roller rink. I remember going to the roller rink in my hometown for a birthday party. I was terrible at skating and I fell down. I risked wiping someone out and having them break an arm. I remember getting better (or I’d like to think I did), but also that I spent time off to the side with my friends. There were no obstacles for me other than my initiative and my learning curve. If I was TRULY bad and dangerous, I’m hoping that some adult would have assisted me to reduce my danger to others. There’s also a fact that on a roller rink, people skate in the same direction for a reason… you can watch everyone around you to minimize their (literal) impact on your life. Liability can be controlled with paperwork. It can also be controlled by engaging with others. It can be controlled by supervision. It can be controlled by ten minutes of playing a slower song and calling it “beginners time” on the rink where everyone is asked to look out for one another, be encouraging, and support a love of cooperation and play for everyone. It’s 2015. We’re all smart enough that we can control and minimize risk. More importantly, we should all be aware enough that inclusivity makes our community better. Let’s start with trying to figure something out and make it a “win win”. It’s 2015. Let’s explain our concerns and see if the world is ready for new solutions. Postscript #2: I scanned through the comments on the ADN article (never a fully wise decision to do). I think that they reiterate that we should all just stop for a second and think about what being inclusive means. Also… inform ourselves. That might be asking too much. When you get into the mechanics of optimizing a mentoring relationship, it involves understanding learning styles, communication, and a whole big messy bunch of “trying to understand another human being who isn’t me”. A good example is establishing the difference between an error and a mistake. I’ll borrow this from something I saw online: An error does not become a mistake until you refuse to correct it. When I’m working with people, I expect errors. That’s why we’re working together: I hope that they catch my errors and I catch theirs. As a supervisor, if the same error happens twice I’ll be clear about discussing that when an error happens twice, it becomes a mistake. A mistake can be avoided. When an error happens twice, we discuss how we can avoid it again. This might reside with the employee, or perhaps we change the way the company works or how we support staff. If an error happens three times, then it’s truly a mistake. It’s a similar discussion of how to avoid it, but then it also starts to venture into Human Resources territory. I assess whether there are roadblocks in the way of success that can be solved, or if it is personality-based. The point of this is that we should have an intentional system in place that absorbs errors and minimizes mistakes. It needs to be an open discussion where people are encouraged to push themselves. Errors can be good when they are a product of learning and pushing oneself. In that light, errors are an indicator of a healthy, learning workplace where people are trying hard. There’s a current approach to business that is themed “make mistakes faster”. It doesn’t sound as good, but I wish it were “make errors faster”. The idea is that we move ahead and learn from what we do. I’d just emphasize again that errors are good… mistakes not so much. But… it’s just semantics!!! At the end of the day we just need to find the right words to have a mutual understanding. Let’s just learn from our errors/mistakes/boo-boos/blunders.